How big are the “megajournals” compared to arXiv? To have a clear comparison I shall look at the window 2010-2014. Before showing the numbers, there are some things to add. I invite you to read it, it is interesting as usual. 2. Usually, the activity of counting articles is that dumb thing which is used by managers to hide behind, in order to not be accountable for their decisions. Counting articles is a very lossy compression technique, which associates to an article a very small number of bits. These discussions made me realize that the arXiv model is carefully edited out from reality by the creators and core supporters of green OA and gold OA. Now, let’s see those numbers. Just how big is that arXiv thing compared to “megajournals”? – it covers fields far less attractive and prolific than the megajournals. – also a reaction of support for what most of them think is “green OA”, namely to put their work there where is away from the publishers locks. See this post and the replies on G+ at [archived post]. It has never occurred to me that putting an article in a visible place (like arXiv.org) is parasitic green OA. +Michael B. Eisen calls it parasitic because he supposes that this has to come along with the real publication. But what if not? Then, compared to that, gold OA appears as a progress. I think gold OA, in the best of cases, is a waste of money for nothing. who sees two possible futures, green (without the assumption from Eisen post) and gold. I think that the future comes faster. It is already here. Relax. Try validation instead peer review. Is more scientific. Definition. Peer-reviewed article: published by the man who saw the man who claims to have read it, but does not back the claim with his name. The reviewers are not supermen. They use the information from the traditional article. The only thing they are supposed to do is that they read it. This is what they use to give their approval stamp. Validation means that the article provides enough means so that the readers can reproduce the research by themselves. This is almost impossible with an article in the format inherited from the time when it was printed on paper. But when the article is replaced by a program which runs in the browser, which uses databases, simulations, whatever means which facilitate the validation, then the reader can, if he so wishes, make a scientific motivated opinion about this. Practically the future has come already and we see it on Github. Today. Non-exclusively. Tomorrow? Who knows? Going back to the green-gold OA dispute, and Elsevier recent change of sharing and hosting articles (which of course should have been the real subject of discussions, instead of waxing poetic about OA, only a straw man). This is not even interesting. The discussion about OA revolves around who has the copyright and who pays (for nothing). I would be curious to see discussions about DRM, who cares who has the copyright? But then I realised that, as I wrote at the beginning of the post, the future is here. Here to invent it. Open for everybody. I took the image from this post by +Ivan Pierre and modified the text. Don’t forget to read the replies from the G+ post. I archived this G+ post because the platform went down. Read here why I deleted the chemlambda collection from G+. 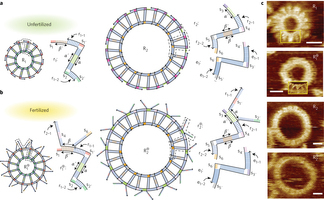 The replication mechanism for circular bacterial chromosomes is known. There are two replication forks which propagate in two directions, until they meet again somewhere and the replication is finished. In the artificial chemistry chemlambda something similar can be done. This leads to some interesting questions. But first, here is a short animation which describes the chemlambda simulation. The animation has two parts, where the same simulation is shown. In the first part some nodes are fixed, in order to ease the observation of the propagation of the replication, which is like the propagation of the replication forks. In the second part there is no node fixed, which makes easy to notice that eventually we get two ring molecules from one. If the visual evidence convinced you, then it is time to go to the explanations and questions. The replication of the circular molecule from the animation is done with an artificial chemistry model. The natural question to ask is: are these chemistries the same? This is a real ring molecule, made of patterns which, themselves are made of DNA. The visual similarity with the start of the chemlambda simulation is striking. 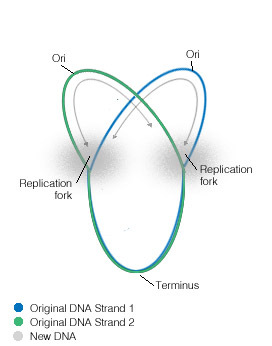 But this DNA ring is not a DNA ring as in the first figure. It is made by humans, with real chemistry. Are there real chemical assemblies which react as of they are nodes and bonds of the artificial chemistry? Like actors in a play, there could be a real chemical assembly which plays the role of a red atom in the artificial chemistry, another real chemical assembly which plays the role of a green atom, another for a small atom (called “port”) and another for a bond between these artificial chemistry atoms. 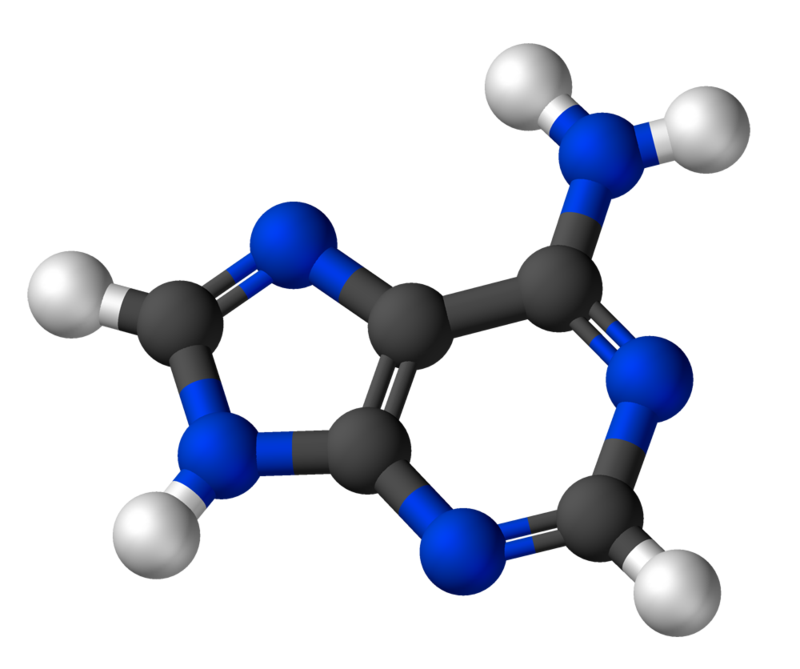 Similarly, there are real molecule which could play the role of bonds. As an ilustration (only), I’ll take the D-deoxyribose, which is involved into the backbone structure of a DNA molecule. So it turns out that it is not so easy to answer to the question, although for a chemist may be much easier than for a mathematician. 0. (few words about validation) If you have the alternative to validate what you read, then it is preferable to authority statements or hearsay from editors. Most often they use anonymous peer-reviews which are unavailable to the readers. Validation means that the reader can make an opinion about a piece of research by using the means which the author provides. Of course that if the means are not enough for the reader, then it is the author who takes the blame. 1. Chemlambda is a model of computation based on artificial chemistry which is claimed to be very closed to the way Nature computes (chemically), especially when it comes to the chemical basis of computation in living organisms. This is a claim which can be validated through examples. This is one of the examples. There are many other more; the chemlambda collection shows some of them in a way which is hopefully easy to read (and validate). A stronger claim, made in the article Molecular computers (link further), is that chemlambda is real chemistry in disguise, meaning that there exist real chemicals which react according to the chemlambda rewrites and also according to the reduction algorithm (which does random rewrites, as if produced by random encounters of the parts of the molecule with invisible enzymes, one enzyme type per rewrite type). This claim can be validated by chemists. 2. In the animation the duplication of the ring molecule is achieved, mostly, by the propagation of chemlambda DIST rewrites. A rewrite from the family DIST typically doubles the number of nodes involved (from 2 to 4 nodes), which vaguely suggest that DIST rewrites may be achieved by a DNA replication mechanism. So, from my point of view, the question I have is: are there DNA assemblies for the nodes, ports and bonds of chemlambda molecules? 3. In the first part of the animation you see the ring molecule with some (free in FRIN and free out FROUT) nodes fixed. Actually you may attach more graphs at the free nodes (yellow and magenta 1-valent nodes in the animation). You can clearly see the propagation of the DIST rewrites. In the process, if you look closer, there are two nodes which disappear. Indeed, the initial ring has 9 nodes, the two copies have 7 nodes each. That is because the site where the replication is initiated (made of two nodes) is not replicated itself. You can see the traces of it as a pair of two bonds which connect, each, a free in with a free out node. In the second part of the animation, the same run is repeated, this time without fixing the FRIN and FROUT nodes before the animation starts. Now you can see the two copies, each with 7 nodes, and the remnants of the initiation site, as a two pairs of FRIN-FROUT nodes. The idea is that it is possible to copy a computer which executes a program, during execution, and to produce working clones. All this without any control (hence decentralized) and any synchronization. More than that, the multiple copies are done in the same time as the computers compute. I think is crazy, there’s nothing like this on the offer. This is a proof of principle. The post is a light (hopefully) introduction into the subject. This animation starts with one Turing Machine and ends with three Turing Machines. 1. Everybody knows what is a TM. Computers are the real thing which resembles most to a TM. There is lot of stuff added, like a screen, keyboard, a designer box, antennas and wires, but essentially a computer has a memory which is like a tape full of bits (0 and 1) and there is a processor which is like a read/write head with an internal state. When the head reads a bit from the tape then the internal state changes, the head writes in the tape and then moves, according to some internal rules. 2. These rules define the TM. Any rule goes, but among them there are rules which make the TM universal. That means that there are well chosen rules such that if you first put on the tape a string of bits, which is like the OS of the computer, and if you place the head at the beginning of this string, then the TM (which obbeys those clever rules) uploads the OS and then it becomes the TM of your choice. 3. From here it becomes clear that these rules are very important. Everything else is built on them. There are many examples of rules for universal TM, the more or less precise estimate is that for a tape written with bits (0 and 1) the known universal TM need about 20 rules. 4. Just a little bit earlier than the TM invention, lambda calculus has been invented as well, by Alonzo Church. Initially the lambda calculus was a monumental formalism, but after the TM invention there was a variant of it, called untyped lambda beta calculus, which has been proved to be able to compute the same things as a TM can compute. The untyped lambda beta calculus is famous among the CS nerds and much less known by others (synthetic biologists, I’m looking at you) who think that TM are the natural thing to try to emulate with biology and chemistry, because it is obviously something everybody understands, not like lambda calculus which goes into higher and higher abstractions. Such exceptions aside, the general idea is: TM easy, LC hard.That is false and I shall prove it. The side bonus is that I can teleport Turing machines. 5. If we want to compare TM with LC then we have to put them on the same footing, right? This same footing is to take the rules of TM and the reductions of LC as rewrites. But, from the posts about chemlambda, rewrites are chemical reactions! So let’s put all in the chemlambda frame. LC and TM are both compatible with the chemical approach a la chemlambda, in the sense that chemlambda can be enhanced by the addition of “bits” (red and green 2 valent nodes), head move (Arrow element) and TM internal states (other 2-valent nodes) and by some “propagation” rewrites, such that chemlambda can now do both TM and LC in the same time! – a small ring of green (2-valent, bit 0) and pale green (a state of a TM). That small ring is a TM tape which is “abstracted”, i.e. connected to a lambda abstraction node, which itself is “applied” (by an application A node) to the fanout tree. What happens? Eventually there are produced 3 TM (you see 3 tapes) which function independently. They are actually in different states, because the algorithm which does all this is random (it does a rewrite if a coin has the fancy to drop in the right state). The algorithm is random (simulation of asynchronous behaviour) and all rewrites are local (simulation of decentralized). Only a simulation which shows it is perfectly possible. The real thing would be to turn this into a protocol. The reader becomes the reviewer. The reader can validate, if he wishes, any piece of research which is communicated in the article. The reader can see or interact with the research communicated. By having access to the data and programs which have been used, the reader can produce other instances of the same research (i.e virtual experiments). In the case of the article presented as an example, embedded in the article are animations of the Ackermann function computation and the other concerning the building of a molecular structure. These are produced by using an algorithm which has randomness in the composition, therefore the reader may produce OTHER instances of these examples, which may or may not be consistent with the text from the article. The reader may change parameters or produce completely new virtual experiments, or he may use the programs as part of the toolbox for another piece of research. This is the future of research communication. This is a neuron-like artificial molecule, simulated in chemlambda. Made with quiner.sh and the file neuron.mol as input. Needs explanations, because this is not exactly the image used for a neuron in a neural network. 1. In neural networks a neuron is a black box with some inputs and some outputs, which computes and sends (the same) signal at the outputs as a function of the signals from the inputs. A connection between an output of one neuron and an an input of another has a weight. The interpretation is that outputs represent the axon of a neuron, which is like a tree with the root in the neuron’s soma. The inputs of the neuron represents the dendrites. For a neuron in a neural network, a connection between an input (leaf of a dendrite) and an output (leaf of an axon) has a weight because it models an average of many contact points (synapses) between dendrites and axons. The signals sent represent electrical activity in the neural network. 2. Here, the image is different. Each neuron is seen as a bag of chemicals. The electrical signals are only a (more easy to measure) aspect of the cascades of chemical reactions which happen inside the neuron’s some, in the dendrites, axon and synapses. Therefore a neuron in this image is the chemical reactions which happen. From here we go a bit abstract. or B-type unorganised machine, which is made by more or less identical neurons (they compute a boolean function) which are connected via a connection-modifier box. A connection modifier box has an input and an output, which are part of the connection between two neurons. But it has also some training connections, which can modify the function computed by the connection modifier. so that actually a B-type unorganised machine is an A-type unorganised machine (same machine without connection modifiers), where we see the connection modifiers as certain, well chosen patterns of neurons. OK, the B-type machines compute by signals sent and received by neurons nevertheless. They compute boolean values. 4. What would happen if we pass from Turing to Church? Let’s imagine the same thing, but in lambda calculus: neurons which reduce lambda terms, in networks which have some recurring patterns which are themselves made by neurons. Further: replace the signals (which are now lambda terms) by their chemical equivalent — chemlambda molecules — and replace the connection between them by chemical bonds. This is what you see in the animation. The soma of this neuron is a single node (green), it represents an application node. There are two dendrites (strings of red nodes) which have each 3 inputs (yellow dots). Then there are two small molecules at the end of the dendrites which are chemical signals that the computation stops there. Now, what happens: the neuron uses the Y combinator to build a tree of application nodes with the leaves being the input nodes of the dendrites. When there is no more work to do the molecules which signal these interact with the soma and the axon and transform all into a chemlambda quine (i.e. an artificial bug of the sort I explained previously) which is short living, so it dies after expelling some “bubbles” (closed strings of white nodes). 5. Is that all? You can take “neurons” which have the soma any syntactic tree of a lambda term, for example. You can take neurons which have other axons than the Y-combinator. You can take networks of such neurons which build and then reduce any chemlambda molecule you wish. 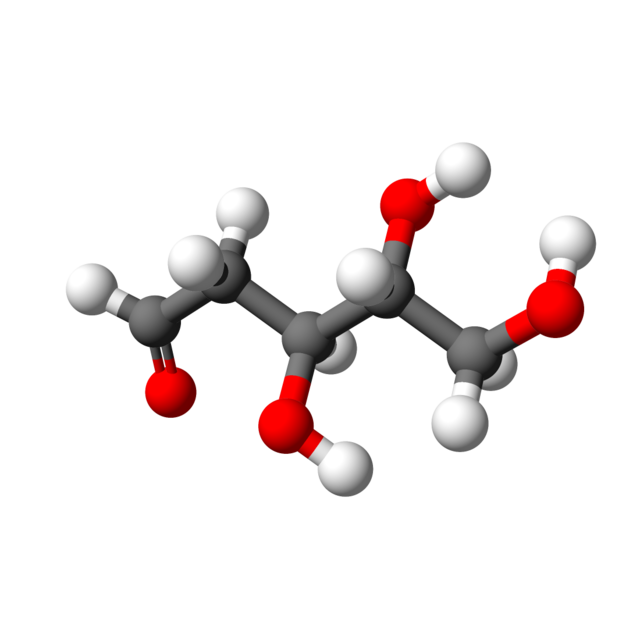 In previous posts from the chemlambda collection I wrote about the simulation of various behaviours of living organisms by the artificial chemistry called chemlambda. As the story is told backwards, from present to the past, there will be more about reproduction later. Now, that is one side of the story: these artificial microbes or molecules manifest life characteristics, stemming from an universal, dumb simple algorithm, which does random rewrites as if the molecule encounters invisible rewriting enzymes. So, the mystery is not in the algorithm. The algorithm is only a sketchy physics. But originally this formalism has been invented for computation. It does pass very well standard computation steps, as well as nonstandard ones (from the point of view of biologists, who perhaps don’t hold enough sophisticated views as to differentiate between boring boolean logic gates and recursive but not primitive recursive functions like the Ackermann function). In the following animation you see a few seconds screenshot of the computation of a factorial function. Recall that the factorial is something a bit more sophisticated than a AND boolean gate, but it is primitively recursive, so is less sophisticated than the Ackermann function. During these few seconds there are about 5-10 rewrites. The whole process has several hundreds of them. How are they done? Who decides the order? How are criteria satisfied or checked, what is incremented, when does the computation stop? Then, how it works? Everything necessary is in the graphs and the rewrite patterns they show. It is like in Nature, really. In Nature there is no programmer, no function, no input and output, no higher level. All these are in the eyes of the human observer, who then creates a story which has some predictive power if it is a scientific one. All I am writing can be validated by anybody wishing to do it. Do not believe me, it is not at all necessary to appeal to authority here. So I conclude: this is a system of a simplified world which manifest life like behaviours and universal computation power, in the presence of randomness. In this world there is no plan, there is no control and there are no externally imposed goals. Very unlike the Industrial Revolution thinking! lisfact_2_mod.mol and to follow the instructions.